I'm not sure where I've heard it but I know I heard it because it won't leave my head: vegans are saying things such as "I don't care what you eat so long as it's not an animal product" or "being vegan means not having to say I'm sorry to what's on your plate." I'm paraphrasing here, but that's the gist of what seems to be all over the vegan social media. Probably has been for a while, but I'm often slow on the uptake. 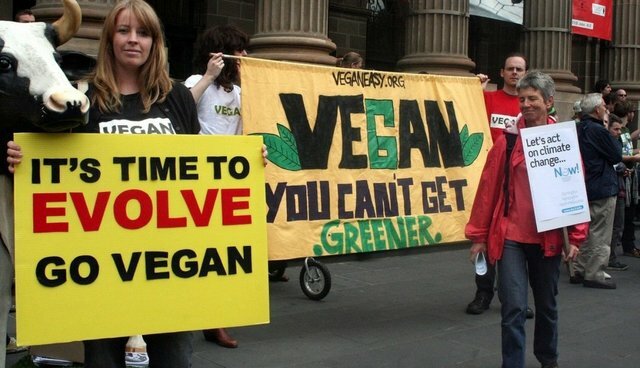 I do know this, though: vegans should avoid these kind of slogans. It wrongly indicates that because you, virtuous vegan, have made one ethical choice about how to eat---avoiding animals--- that all other ethical matters bearing on food are irrelevant. Needless to say, eating animals is just one of many ethical concerns that accompany the production and consumption of food. Many consumers who eat animals approach their diets with as much ethical deliberation as vegans do (maybe more), but they do so by focusing on other concerns--very real concerns such as labor treatment, ecological impact, and public health. In general---as the aforementioned slogans indicate---ethical vegans do a mediocre job at best integrating their concerns about animals rights into these (equally?) critical moral issues (to be fair, those focused on other concerns aren't so cooperative either when it comes to animal rights). One reason for this reticence may be that incorporating other ethical concerns into our choice-making matrix blurs the ethical clarity that so many vegans take for granted. As much as we might like to think that eating ethically is simply about not eating animals, that's only the start of things. In fact, by making the noble decision to bother about animals at all, you open up many other cans of worms---and things can get sort of messy real quick. From this perspective, you can see why so many intelligent people go, "no, I don't want to know!" Consider this scenario: you have a choice between eating roadkill and eating a plate of vegetables harvested by child slaves. If the slogan "I don't glare what you eat so long as it's not an animal product" holds, then you are forced by an overly rigid conceptualization of veganism to exploit child slaves rather than eat an animal that in no way was intentionally harmed for your consumption. You are, in other words, forced by your belief system to make an arguably immoral choice. That's an extreme case, but one could easily see how, as you leave the margins, the decisions become veritable toss-ups. For example, what if the choice was between eating oysters (questionably sentient critters) or a bowl of rice grown with water diverted from a subsistence village suffering a drought? Anyway, you get the idea. I've often criticized carnivorously-inclined sustainable food people for putting "soil ahead of sentience." But I'm coming to realize that there can also be ethical problems with placing sentience ahead of soil. More to the point, I'm coming the difficult realization that eating ethically is not about drawing a line in the sand (soil?) between plants and animals and mouthing a bunch of slogans about your superior choice. It is, for sure, about not eating animals raised to be food, but it's also about merging that choice with so many others that deserve our ethical attention. If you've made the choice to go vegan, well done. But now the real work begins.